Such was the opinion of famed Italian sculptor, Antonio Canova. He said that it was 'alone worth coming from Rome to London to see' the Strand (Waterloo) Bridge. London in 1815 was a city of 1.4 million people, possessed of few bridges in its most populous areas. Only Westminster, London and Blackfriars bridges, aided by the ubiquitous watermen aided crossing of the Thames. Something had to be done. In 1809 a Act was passed permitting the construction of the Strand Bridge, and authorizing the proprietors to raise 500,000 pounds for the purpose. In 1811, construction commenced. The Strand Bridge eventually cost over a million pounds sterling. The engineer placed in charge of the project was John Rennie, a largely self-taught mechanical and civil engineer. His very successful career included factory and canal building as well as bridges, and the design and the engineering of the Strand bridge was widely acclaimed. The foundations of the bridge were built using coffer-dams, considered a superior method of construction, and the superstructure was built of Craigleith and Derbyshire granite. It has been well said that the accuracy of the work is as extraordinary as its beauty. London was soon to add Vauxhall and Southwark Bridges to its list of river structures, but the Waterloo Bridge has long held a special place in the hearts of Londoners. In the Spring, one's fancy turns to...botanical notation? Well, of course, it's not spring yet. But my seed catalogues have arrived, and so I'm hoping that, on schedule, the snow will melt and things will grow again. Meanwhile I'm poring over the catalogues deciding what to try to grow this year from seed, and reading all the botanical, Latin names of popular flowers. 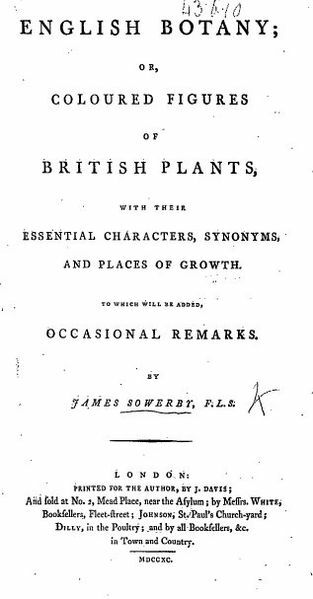 Those Latin names--so useful when a plant has ten popular names--would not have existed but for people like James Edward Smith. He was born in 1759, and began his studies in natural history--his lifelong love--in the 1780s. 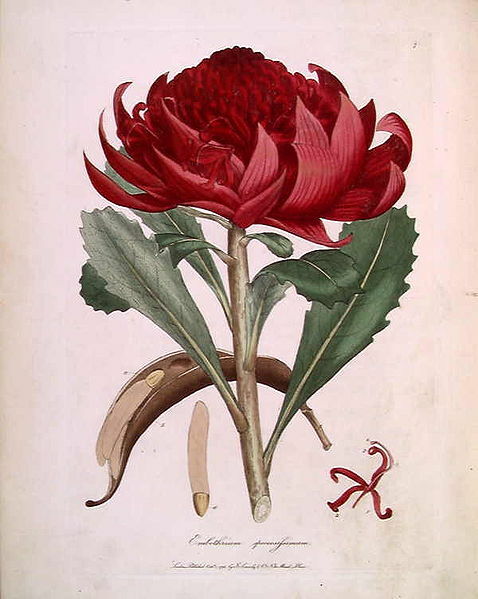 His leanings toward botany were strengthened by a European trip to visit botanists and herbaria, and a friendship with Sir Joseph Banks. Joseph Banks (1743-1820) was the adventurer of the botanical world--traveling the globe and returning with fantastic examples of plant growth from newly discovered countries. By contrast Carl Linnaeus (1707-1778) was the interpreter of the natural world--classifying, organizing and naming the discoveries being made. James Edward Smith, on the other hand, was to aid in the dissemination of all the information being amassed by a busy group of naturalists including Samuel Curtis, Jean-Baptiste Lamarck, William Roscoe and David Douglas. In the 1780's Smith purchased the entire collection of Carl Linnaeus for £1000, and in 1788 he founded the Linnean Society of London. He then collected an impressive library and constantly added to his botanical collections. 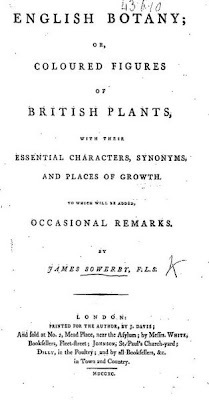 By 1790 Smith was beginning to write on botany, and he spent the rest of his life making botanical knowledge available to the world. His great work, the Flora Britannica, a classification of English plants, entirely in Latin and utilizing Linnaeus' work, was balanced by English Botany, a more accessible and popular book. Although Smith's name is not mentioned on this title page, he provided all the descriptions in the book, and was credited as its author. 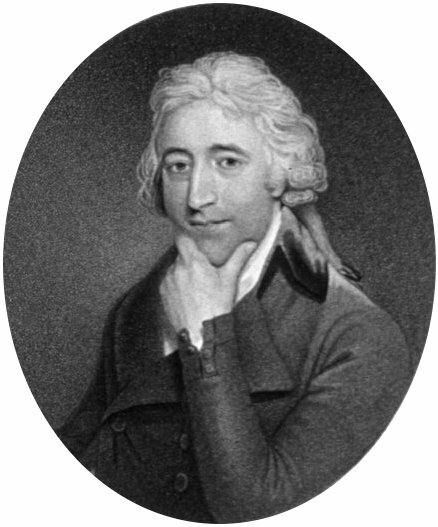 He and James Sowerby collaborated several times on publications. 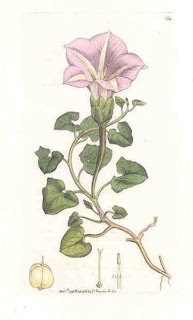 The beauty of Sowerby's illustrations made English Botany a popular series of volumes in the growing body of work appealing to a general public with increasing nineteenth century leisure to devote to their gardens. Smith contributed over three thousand articles to Rees's Cyclopedia, an important nineteenth century encyclopedia. He was instrumental in bringing to publication the Flora Graeca begun by his acquaintance John Sibthorp. Smith published a book on American insects in 1797, translated Linnaeus' book on Lapland, wrote An introduction to physiological & systematical botany and A Grammar of Botany. Today his plant collections form the basis of the Smith Herbarium at the Liverpool Botanic Garden. At last autumn's used book sale, I found a treasure inside a book--two treats for the price of one! This surprise was a book mark and, as you can see, it is charming. I would think, from the design, that it dates to the 1930's or thereabouts. But it was the date 1815 that caught my eye. This was worth investigating. I discovered that the Scottish Widows' Fund and Life Assurance Society was indeed founded in 1815, but it was three years before, in March 1812, that the idea had been broached of the need for "a general fund for securing provisions to widows, sisters and other females". The Napoleonic Wars were, of course, the cause for this concern. The idea of 'life insurance' has been around since antiquity. Romans paid into 'burial clubs' and and traders looked for a means of providing benefits for their survivors. But the business of offering life 'assurance' really took hold in the eighteenth century. There were several English companies by 1800, but the Scottish Widows' Fund was the first such company in Scotland. The story goes that several eminent Scotsmen met at the Royal Exchange Coffee Rooms in Edinburgh, in 1812, to discuss the possibility of the Fund. It took them three years, but in 1815 they were open for business. By 1821 they were doing so well that they purchased their first office building. The sketchy details of the founding of the company are what really interest me. I tried to discover the names of the 'eminent Scotsmen' but the Scottish Widows' Fund did not answer my email. (Yes, they do still exist, and are a highly regarded provider of financial services, apparently.) I would love to know the names and the histories of the men who put this idea into action. I was also fascinated by the location of the meeting. 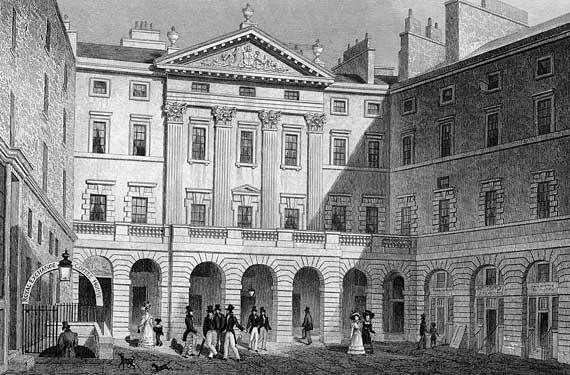 The Royal Exchange, I discovered, is a well know Edinburgh building begun in 1754 and completed in 1761. It was a commercial building specifically built for merchants to conduct their business. It was a handsome building, as the print of 1829 below displays. In its earliest years, it must have been an icon of the newest architectural designs and a gem of the 'Modern Athens'. The Royal Exchange--now the City Chambers of Edinburgh--still exists. And its exterior is very little changed from this view. The fact that the 'eminent gentlemen' met in the Coffee Rooms of the Royal Exchange was interesting also. We know that the 18th and 19th century coffee-houses were extensions of gentlemen's offices and clubs and certainly this new building was well-provided with them--there are three. This plan above must be one of the original architectural drawings of the Royal Exchange. The Coffee-rooms are marked D, E, and F, and are noted as being 'on a level with the street'. Coffee-room F has two smaller private rooms appended to it. Were they for meetings? Did the 'eminent gentlemen' meet in one of these rooms? It is interesting to speculate on the 'widows, sisters and other females' that the Scottish Widows' Fund aided in its earliest years. Their stories were no doubt sad, but perhaps their circumstances were mitigated by formation of the Fund. My surprise find certainly led me to some interesting research and a fund of ideas for stories! After Friday's post, my readers rallied round with more information. Many thanks to Joanna and Eleanor for their help with the Scottish Widows Fund. Regency researcher extraordinaire Joanna Waugh discovered the Annals of the Scottish Widows Fund at the Internet Archive. It has all the information I wanted, and more. Follow the link for more fascinating facts. Will your name be remembered? Hannah More, Sarah Trimmer, Maria Edgeworth, Mary Russell Mitford, Barbara Hofland. Wait! Barbara Hofland? You have probably heard of the other authors of the late eighteenth and early nineteenth century. But Barbara Hofland is one of the many 'lady' writers of the period whose names are now unknown to those with an interest in the Regency era. These writers are still recognized in the academic community but they have faded from the public consciousness. Barbara Wreaks was born in 1770 in Yorkshire to an affluent merchant family. On her father's death, she was raised by a maiden aunt, and seems to have been a resourceful, independently minded woman. 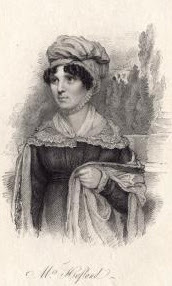 She first founded and owned a millinery shop (about 1795), then later, a school in Harrogate (1809-1811). Her downfall lay in her marriages. She was married for three years to Thomas Hoole and gave birth to a son. But she was left impoverished by the collapse of Hoole's business after his death in 1799. Her subsequent marriage in 1811 to talented but ineffectual artist Thomas Hofland lasted for more than thirty years. She was the family's financial provider for that entire period. Barbara had begun to write for a Sheffield newspaper in 1794. When she was widowed and impoverished she increased her literary efforts and published poems and verse with which she was able to support herself and her son. Eventually she had to support her husband as well. 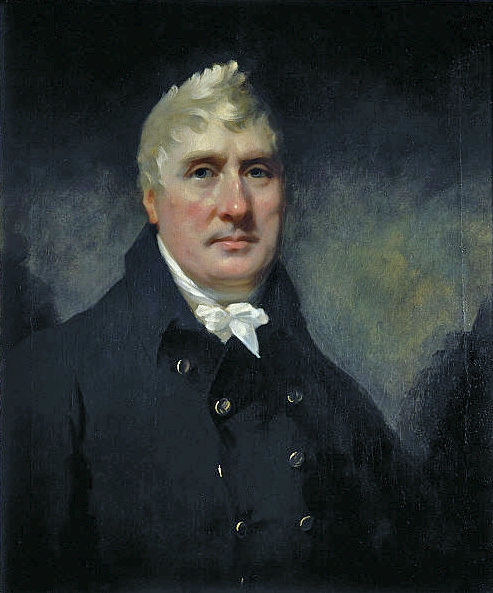 With a move to London in 1811, Hofland's literary future was secured. Her 1812 book "The Daughter-in-Law" impressed Queen Charlotte. Her most popular book "The Son of a Genius" went to multiple editions, foreign translations and American reprints. It is suggested its story of the harm a feckless nature can produce was based on her second husband's failings. Barbara Hofland published over sixty books, but was never wealthy. Her work is thought by some to have influenced the creation of Jane Eyre and Oliver Twist. Certainly her books provide a close, and invaluable, look at the realities of life in the early nineteenth century. Barbara was a friend of John Soane, Maria Edgeworth and Mary Russell Mitford. Her work was no more or less tedious than that of other moralistic children's writers like Hannah More and Sarah Trimmer. Yet her name is not, today, well-known. What is the cause for such inequity of memory? A good biographer? The quantity of mentions of her name in the past two hundred years? Inclusion in literary anthologies and historical collections? Is who is remembered, and who is not, all a matter of chance? This last seems possible. The shade of Mary Martha Sherwood would probably like to know the answer. She wrote over four hundred works and I had never hear her name either until I undertook this research! Happy New Year and all the best in 2013!